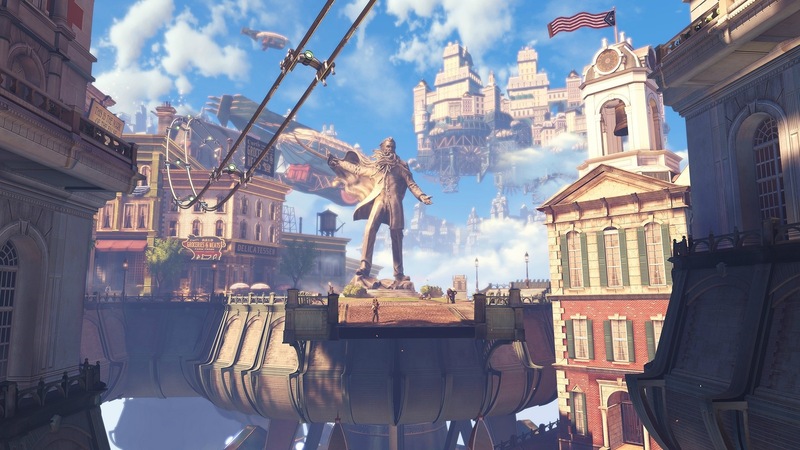 When I wrote my original thoughts about Bioshock Infinite, I was worried that I would be the only dissenting opinion among a sea of praise. A couple of weeks later, turns out my fears were pretty unfounded, and many others have joined in creating a real dialogue about the game. I’m glad to see this happening, with lots of diverse opinions and thoughts being shared. This has honestly been the best thing about Bioshock Infinite’s release; it seems to have been very thought-provoking to a lot of people. Unfortunately, a lot of the discussion seems to have be boiled down to a question of if the game is too violent. 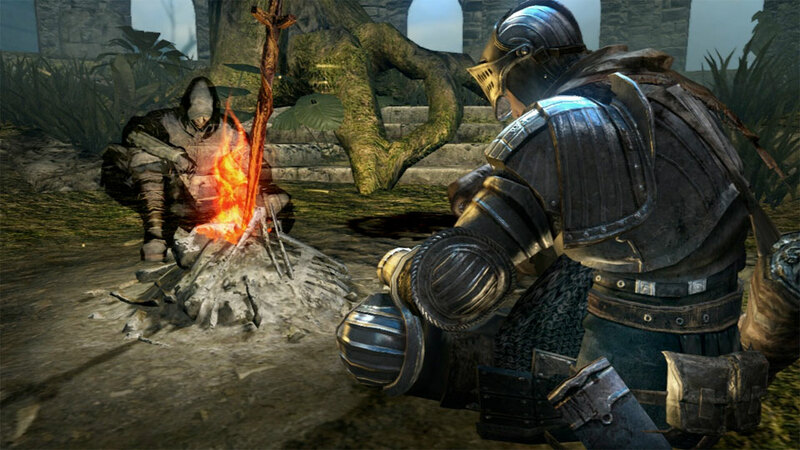 Although the level of violence in the game is certainly a cause for concern, and arguably limits the audience of potential players. I feel as though there is a certain amount of nuance that has been lost. The game is a hodgepodge of things that just don’t fit well together, namely ultraviolent power fantasy and a strong but naive heroine with whom we empathize. There is nothing wrong with the violence, but because it is nothing new for a game to be ultra violent, and it is very new for a game to have anyone with whom we empathize, the empathy element is what most gamers will find most striking. Still, for the sake of engaging the current discussion, I will try to address the violence argument. Jim Sterling wrote an excellent rebuttal of the desire of a player to “turn off” the combat or have alternate methods for getting through confrontations. He is absolutely right about this not really being what should be reasonably expected from a sequel to the previous Bioshocks. He is also very right about the game being “about violence,” which is a fact that anyone who is unapologetic about game storytelling can plainly see. It is impossible to tell a story about anything but violence when 90% of the story consists of blowing people’s heads off. However, I feel like his assessment suggests that the game actually has anything interesting to say about the violence. Which, apart from some scripted violent cutscenes, it doesn’t. Nearly all of the violence in the game has absolutely nothing to do with storytelling, and is simply feedback for the mechanics. The combat sequences aren’t “about” anything. They are simply there to give the player something to do. 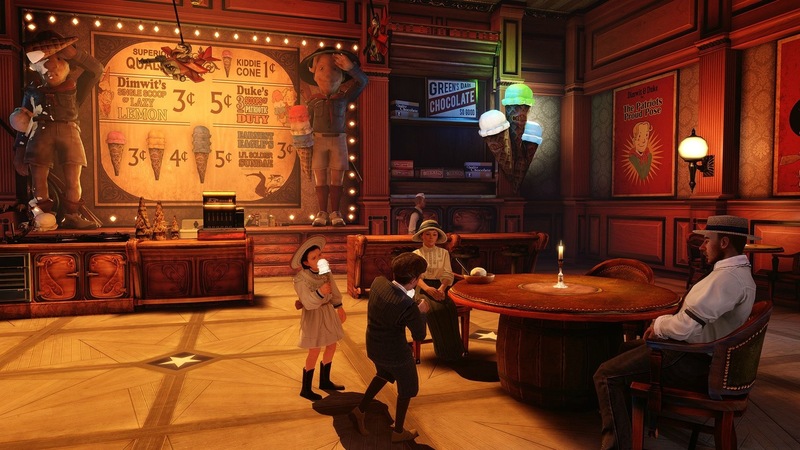 Is Bioshock Infinite a game in a series of shooters? Yes, it is. Did I suddenly expect that Infinite would stop being excessively violent to the detriment of effective pacing or character development? Not really. For me, the promise of the Bioshock series has absolutely nothing to do with Carbines or Vigors or Motorized Patriots. The thing that reached me about the first Bioshock was the setting and the themes. Rapture was just a great place to be in, it felt like there was so much atmosphere to soak up. It was very compelling, in a Dear Esther sort of way, to just explore that world. Using my Plasmids on Splicers only occasionally fit into this experience, but was mostly a diversion from my grand archaeology dig through failed utopia. I think a lot of people who played Bioshock feel pretty similar about it. The little sister choice, the drama of failed dreams, and the beautiful disaster of Rapture were what was interesting, not shocking and wrenching splicers until the genetically-modified cows come home. It’s hard to put my finger on what exactly it is about Infinite that makes it more egregious than both the prior games in the series. My first guess is that it’s the presence of Elizabeth. The team at Irrational actually succeeded at making a companion that “you care about.” So when she reacts so negatively to the violent outbursts that the game forces you into, it is a really uncomfortable place for the player to be seated. Most gamers, believe it or not, are not sociopaths, and would much rather not kill people if they are being called “a monster,” for doing so. This immediately puts the player at odds with the game design, which is obviously built around a power fantasy of zapping dudes with force lightning and then blasting them with a shotgun until their heads explode. I have to kill hundreds of people in order to finish the game. I want to enjoy killing those people, or else this is going to be really tedious. But Elizabeth wants me to stop killing. Even if the story is somehow about the inevitability of violence in this situation, that still doesn’t explain why the violence is so excessive. I don’t just shoot one guy in the face when Elizabeth first calls me a monster. (Though that would be quite enough for most people to see me that way.) Instead, I mercilessly clear a whole room full of people. If this were an isolated incident of mass murder, it might not be a problem. But it is not only repeated many times throughout the game; the encounters actually increase in the number of enemies and decrease in their narrative reason to exist. A good example of a completely unnecessary combat sequence is in the boardwalk area, right before you get to the entrance to the Hall of Heroes. Booker and Elizabeth are walking towards the entrance and the story is moving at a slow but deliberate pace. Tension is being built because we can only imagine what will happen in this new location. However, the tension is broken prematurely by a fight with a dozen or so people who come out of nowhere and start shooting at Booker. Booker dispatches them with some gusto, while Elizabeth cowers behind a statue. Once the last skull has been exploded, Booker and Liz walk in silence into the Hall of Heroes. If you don’t see how this is pointless in regards to storytelling, and simply tedious as a gameplay segment, then you must be blind. Who were those people Booker killed? As far as I can tell, the game never explains who the people you are fighting are. Maybe they are militant citizens, maybe police of some kind. Either way, the violence at this moment served no storytelling purpose whatsoever. If the goal was to remind us that we are not safe just standing around the boardwalk, why did we just have a sequence in which the player can do just that? It’s not only a useless moment, but in context it actually undermines the pacing of the story. As the game goes on, the combat sequences increase in frequency, and the length of time you can wander without running into trouble from nameless people with weapons consequently decreases. Although this shift in pacing actually helps the game to feel less tedious, because a player can start to feel comfortable with the incessant onslaught of murder. It is actually a move in a direction that is, I believe, less interesting. The emotional core of the game resides with Elizabeth. The player wants to get to know her better and relishes quiet moments where some real character development happens, like the infamous musical scene in the basement of a bar. However, quiet moments with Elizabeth are few and far between, and become increasingly more so as the game goes on. We get separated from Elizabeth, so that we can find our way back again. The designers know that the desire to see Elizabeth is the best motivator for the player, so they use her as the carrot on the stick multiple times. She is part character, part damsel-in-distress. Part a real breathing human with wants and desires, part an object which exists as a maguffin for gameplay. There is clearly a lot going on Infinite, and I feel like many of my criticisms are less about this game, and more about games in general. 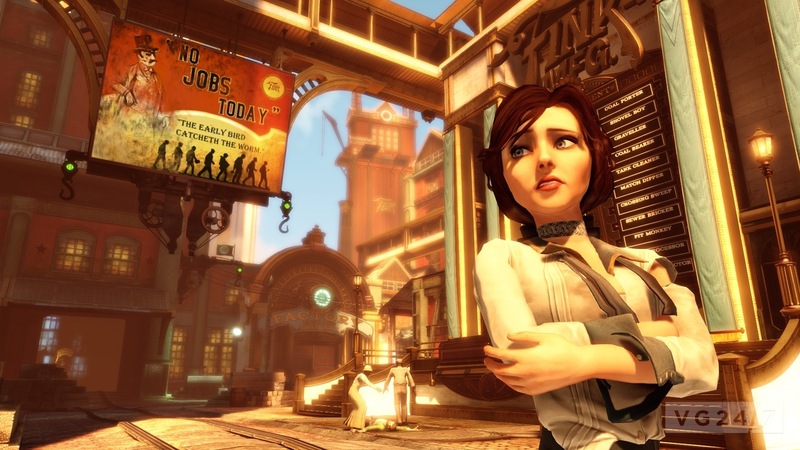 Is Bioshock Infinite unusually violent for a videogame? No. Does it have a well-paced story with good character development compared to most contemporary videogames? Yes. Is it pretty intellectual and heady with its themes when most games struggle with even having themes? Certainly. The problem is that Infinite is surrounded with a sea of games which are too dumb and too violent for any normal (read: non-gamer) person to have an inkling of interest in playing them. It only stands out because it is surrounded by dog-food. It’s pretty delicious, for dog-food. So, are games really art? Roger Ebert has quite famously come out to say that Games cannot be art, or as he calls it “high art.” ( Essentially meaning all forms of art that most people consider when they talk about art. Art as in “artist,” as opposed to “artisan.”) I’m not sure this distinction was entirely necessary to make. I don’t think that many people were attempting to argue that games should be considered art alongside dance or pottery. The question is really about whether games are or are not a medium for communicating ideas and emotions in at least the same capacity as film or books. I am not simply dismissing the issue imposed by Roger Ebert’s statements, but it would seem to me that he does not truly understand games as an art form. More specifically, he does not understand that the way in which games function artistically is quite different from films and other media. Unfortunately, many modern game designers do not understand this distinction either. 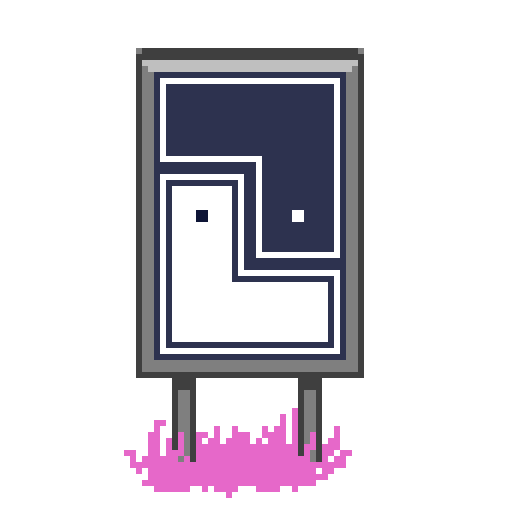 Viewed as works of art, most games are quite meaningless when compared to great works in other mediums. So, can we solve the dilemma we face in dealing with Roger Ebert’s belief? He stated that “If you change [the ending of a story], you become the artist,” proposing, “Would “Romeo and Juliet” have been better with a different ending?” It is here that he makes his claim most poignantly.